In this fun, interactive PBL students choose a destination somewhere around the world to "travel to." 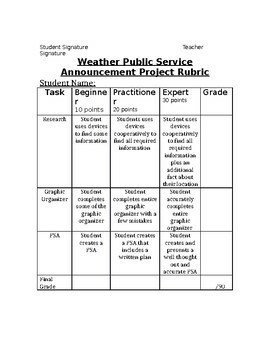 The learners research the location's climate and weather data and then focus on what types of severe weather (hurricanes, blizzards, tornadoes, etc.) are encountered in that area. 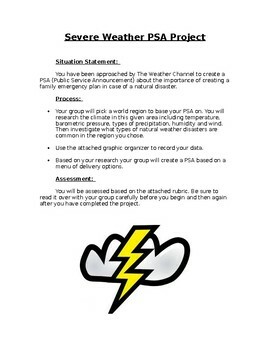 Students then create a PSA (Public Service Announcement) to help inform citizens of their location on how to prepare for this type of severe weather. 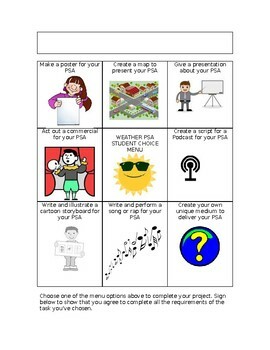 Students choose from a menu of delivery options on how to present their PSA. These range from Podcasts to Songs to 3D Maps. Learning about weather has never been so much fun! 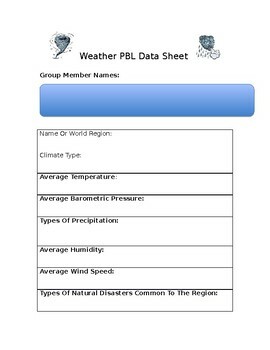 **This unit requires very little prep and allows students to apply their knowledge about weather to a real world situation.